How to Get To a National Or State Park From Historic Rugby: Step Outside. Rugby offers two premier outdoor areas for enjoying a unique mix of activities. In fact, you can walk from the center of the village into a Tennessee State Natural Area or a National Park. 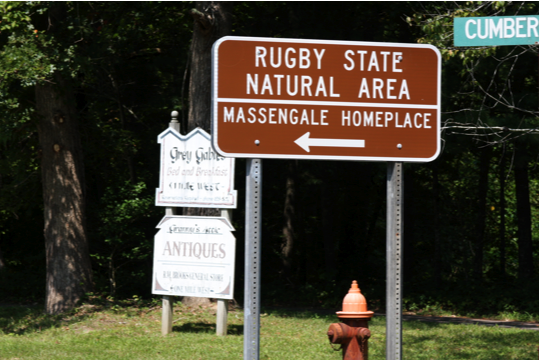 Rugby is adjacent to The Big South Fork National River and Recreation Area and the new Rugby State Natural Area. Activities range from moderate to difficult hiking to Class II kayaking and canoeing on the Clear Fork Creek and White Oak Creek before you get down to the Burnt Mill Bridge. You can’t beat the natural beauty of this area for enjoying everything from a relaxing moment to an energetic and thrilling experience in the outdoors! The southern tip of Big South Fork forms a boundary line for most of the northern end of Rugby. 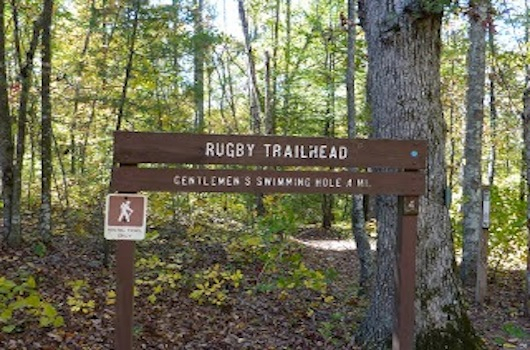 There is one Big South Fork trailhead in Rugby that leads to a circuitous route, first to the The Gentlemen’s Swimming Hole and later to the Meeting of the Waters. Both of these are historic trails that form a loop and were used by the original settlers and are still much enjoyed today! Both trailheads are to the west of the Laurel Dale Cemetery. 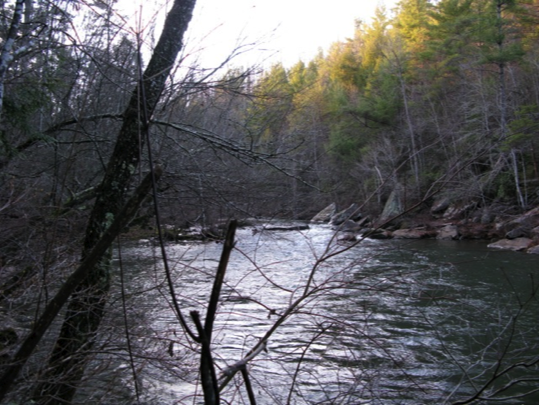 These two beautiful creeks meet at the historic Meeting of the Waters and eventually become the scenic Big South Fork River. There is an interpretive nature trail leading down to the Gentlemen’s Swimming Hole. A fifteen page trail guide gives interpretive information at each one of the ten numbered posts. These trail guides are free-just ask for one at HIstoric Rugby’s Visitor Centre! This trail descends to the Clear Fork Creek and is approximately 0.4 mile long. You can enjoy a dip in the cool water and return the way you came, up a relatively steep ascent (rated moderate), or continue the 0.7 mile on towards the Meeting of the Waters that forms a loop as it returns to the trailhead. Bear in mind that depending on current water flow you may or may not be able to cross over to the rest of the trail at the Meeting of the Waters if it is under water. If it is not passable-simply go back the way you came! The Meeting of the Waters is where the two creeks, the Clear Fork and the White Oak merge and become the South Fork, which as it picks up the streams and creeks on its way down into the gorge becomes the gorgeous Class IV and V Big South Fork River . Villagers often hiked down to the Meeting of the Waters when the water was low and used it as a picnic site. The entire loop is 2.1 miles and is rated moderate to strenuous for the elevation gain and rocky footing. 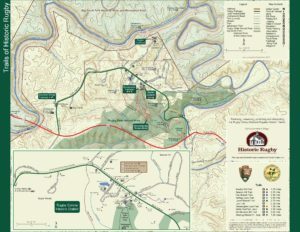 Newly opened in 2010, the 667-acre Rugby State Natural Area offers a unique interpretive experience from the rest of Rugby’s founding as an 1880’s intentional village as it focuses on a homestead built in the 1860’s on top of a ridge with a spectacular view of the Cumberland Mountains. Access begins behind Rugby’s Community Building. 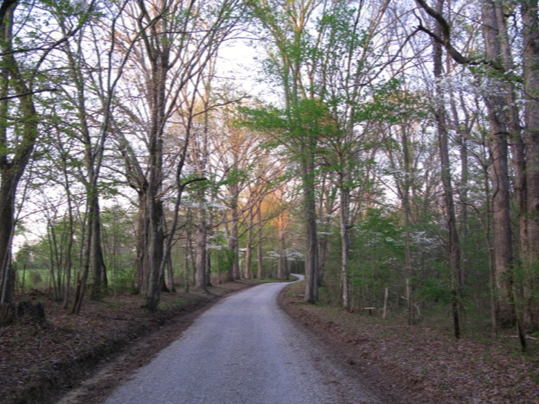 The Massengale Homeplace and Trail is approximately 1.2 miles round-trip and can be enjoyed in several ways. Two kiosks, one at the beginning of the trail and one at the top by the Homeplace site provide lot’s of interpretive information about both the flora and fauna of the area and the Appalachian lifestyle of the period, including photographs. Trail brochures are available at the bottom kiosk (or the Visitor Centre). 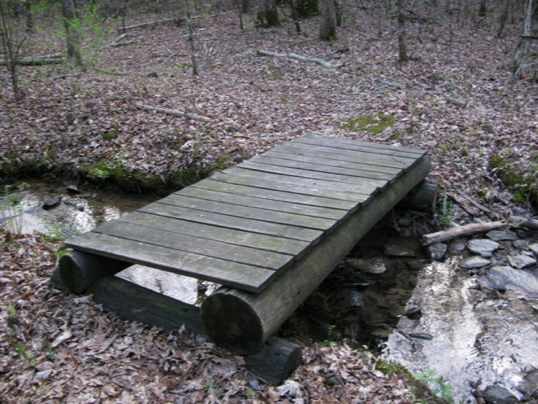 The Massengale Homeplace and Trail was built, in part, with funds from a State Recreational Trails Program (RTP) grant and matching Appalachian Regional Commission (ARC) grant and a grant from Cracker Barrel. Much assistance with the project was given by Lisa Huff, an East Tennessee Region Natural Areas Manager at the Tennessee Department of Environment and Conservation (Also known as TDEC). Barbara Stagg developed the interpretive signage, the trail brochure and the Acoustiguide program. John Gilliat, then Properties Manager for Historic Rugby, and many volunteers including Lummy Massengale, a descendant of the original Massengale family, helped build the trail, the kiosks and the black locust fence. The Laurel Dale Branch Trail is a short and very scenic trail that links the Beacon Hill housing development with the Laurel Dale Cemetery and the trailheads for the BSFRRA leading to the Gentlemen’s Swimming Hole and Meeting of the Waters. This little hollow (or dale) bursts with wildflowers during the spring and is gorgeous any time of year! A nice circuit is to go through the Laurel Dale Branch Trail to the Cemetery Road and turn left towards town. You will eventually catch up to the walkpath on the northern end of town which can take you east back towards Beacon Hill, or west towards Uffington House. Note: Visitors probably shouldn’t attempt Laurel Dale Branch Trail unless the weather has been dry or they are wearing boots that can withstand the mud. The trail gets very muddy in wet weather and is sometimes impassable. Laurel Dale Cemetery Road Trail offers the perfect opportunity for a stroll on a little used road with scenic views. This road begins off of Highway 52 and dead ends at the Laurel Dale Cemetery where three trailheads begin-two that go west into Big South Fork (Gentlemen’s Swimming Hole and Meeting of the Waters), and one that connects back to the Beacon Hill housing development through a little hollow (Laurel Dale Trail) to the east. The nice thing about the Laurel Dale Cemetery Road Trail is that it is enjoyable by itself, but can be added to other trail segments for a longer walk. It can also be used with the AcoustiGuide audio program that interprets the Laurel Dale Cemetery. The audio tour can be purchased at the Visitor Centre at a very ow cost. 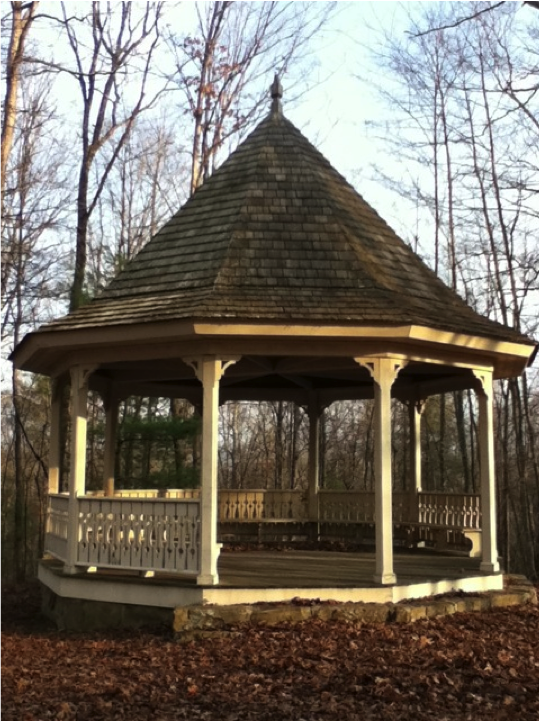 The short Beacon Hill trailhead begins to the north of Christ Church and circles around the bottom of Beacon Hill before going to the top of the hill where the views are lovely and a gazebo awaits the hiker for a brief rest or leisurely contemplation. There are many more ways to enjoy the outdoors in and around Rugby. For more information visit the Area Attractions page.